Fed Raises Key Interest Rate For 4th Time Since 2015 : The Two-Way The quarter-point increase in the Federal Reserve's benchmark rate was widely expected. Rates are still near historic lows, but the increase will mean higher borrowing costs for consumers. 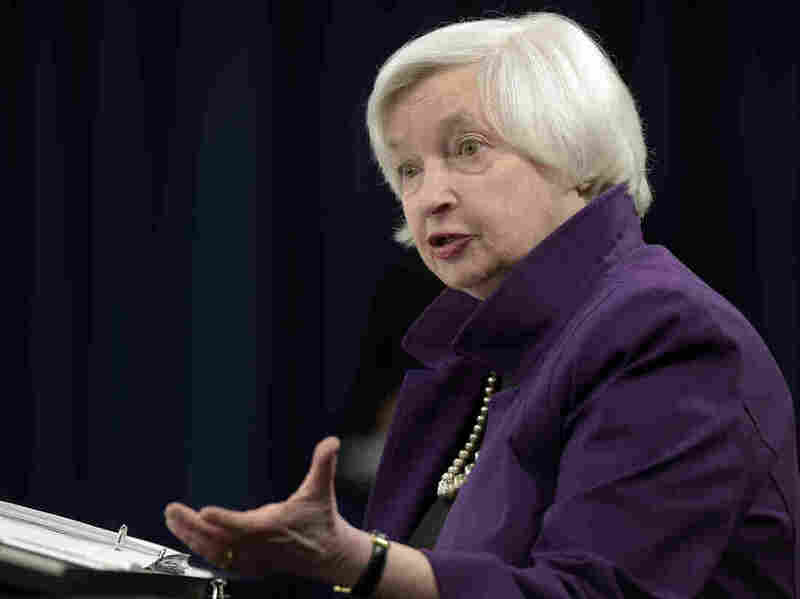 Federal Reserve Chair Janet Yellen speaks to reporters in Washington, D.C., on Wednesday after the Fed announced it would increase interest rates by a quarter-point. Despite the increase — the fourth since December 2015 — interest rates remain near historic lows, but the move will mean higher borrowing costs for consumers. The Fed previously raised rates in March, and on Wednesday, it signaled plans for one more rate increase this year. In a statement Wednesday, the policymakers said that "the labor market has continued to strengthen and that economic activity has been rising moderately so far this year." The economy grew at a rate of 1.2 percent in the first quarter of this year, about half as fast as it did in the final three months of 2016. Unemployment dipped to 4.3 percent in May, a 16-year low. "Job gains have moderated but have been solid, on average, since the beginning of the year, and the unemployment rate has declined," the Fed statement said. "Household spending has picked up in recent months, and business fixed investment has continued to expand." Greg McBride, an analyst with consumer financial site Bankrate.com, tells NPR's Yuki Noguchi that, taken together, the Fed's moves have caused home equity and car loan rates to increase about 1 percentage point over the last two years. "The combination of rising debt burdens and rising interest rates is starting to strain some households, and we're seeing delinquencies pick up from recent lows," McBride says. In the wake of the financial crisis, the central bank added Treasury securities and mortgage-backed securities to its balance sheet. Now it's making plans to reduce those holdings, which total more than $4 trillion. The Fed said it "currently expects to begin implementing a balance sheet normalization program this year, provided that the economy evolves broadly as anticipated." "The central bank said it would gradually ramp up the pace of its balance sheet reduction and anticipates the plan would feature halting reinvestments of ever-larger amounts of maturing securities. "The Fed said the initial cap for Treasuries would be set at $6 billion per month initially and increase by $6 billion increments every three months over a 12-month period until it reached $30 billion per month in reductions to its holdings. "For agency debt and mortgage-backed securities, the cap will be $4 billion per month initially, increasing by $4 billion at quarterly intervals over a year until it reached $20 billion per month."